Sleek; svelte; practical; gorgeous; delightfully unisex. We have to confess, we are fawning a little over the OtterBox Strada Folio for iPhone 7 and 8. This case is truly a perfect blend of both style and practicality. OtterBox has always been known for their exceptionally high quality cases, and alongside with LifeProof, offer the highest levels of protection of any brand on the market. One thing they haven’t always been known for, however, is style. Whilst the latter is something OtterBox have been slowly improving over the years, the Strada Folio is honestly one of the most beautiful cases we’ve ever seen come out of the OtterBox factory. Yet it still retains the practical protection elements that OtterBox are known for. The Strada Folio is a two-component case. The bezelled inner shell is made from polycarbonate, with a sealed power key and ports for speakers, charger and lock key. The gorgeous leather folio is firmly stitched into the back with extra drop protection between the layers, and wraps around the screen with a magnetic clasp. The inner side of the screen cover has space for a single card or minimal cash, and we are happy to report that the magnetic clasp still works when this feature is utilised. Even with a card inserted, it still retains a super-slim profile and pops in and out of pockets without issue. The polycarbonate also feels ever so slightly ‘softer’ than most shells, which lends it better shock protection and a nicer hand feel, without adding any extra bulk or compromising on protection. 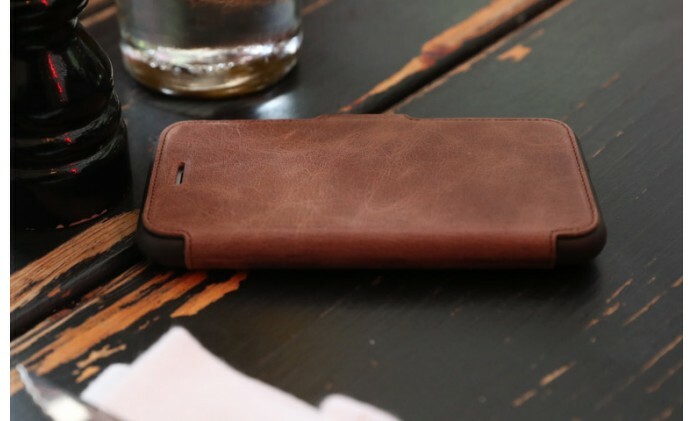 And unlike many folio styles, the leather screen cover includes a tiny port on the earpiece so you don’t have to keep the case open when taking a call. Additionally, the Strada Folio has been through a host of OtterBox’s standardised tests, covering everything from drop testing to makeup and hand lotion testing. Whilst we have a feeling that this case is likely to mark more readily than others do, this is only going to add to the beautiful leather charm as it ages. This versatile case is a winner for most user profiles, with the exception of the tradie, and we heartily recommend it to anyone. It is so good, we gave it 5 stars out of 5!